The Agh Hotel is a pleasant and comfortable place to stay in the Czech Republic. There is a restaurant, which serves traditional Czech cuisine, as well as other world foods. The food is prepared at the table, so you can see these fine chefs in action. The hotel also has a bar, which has a nice atmosphere and is an excellent place to stop in for a quick drink or for a cup of coffee. In the summer time, head out to the terrace to enjoy the sunshine. Other amenities include a laundry service, a saloon, conference facilities and a wine cellar. The hotel is happy to cater both business and personal events, as well. 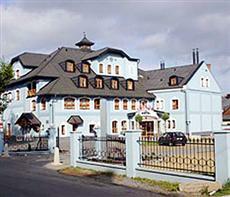 This 3-star hotel is located in the city of Roznov pod Radhostem. It is possible to do many activities in the vicinity. Guests can go hiking, cycling, or skiing (either cross country or downhill is possible.) There is also a cinema close by. Major tourist attractions in the area include the Stramberska truba, a historic tower with a view of the city and the dam Olesna by Frydek-Mistek. The AGH Hotel has wireless Internet access.